Facebook is a fantastic app/website for reading food news written by some of the funniest and best-looking people writing on the internet today. But scrolling through tons of food photos can make you super hungry, and now Facebook has a solution: You can order food through its site. 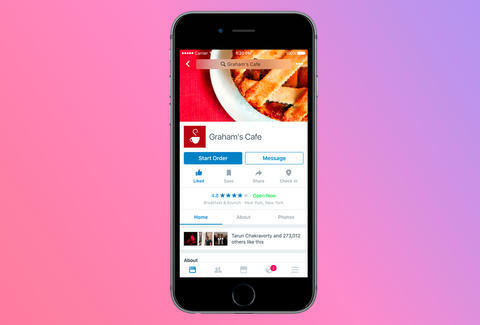 As part of a ton of new features added to the social network (which will also let you book appointments at places like nail salons and buy tickets from Ticketmaster), you can now order food through a restaurant's Facebook page. While you can't order through every restaurant's Facebook page, you can put in a food order at any of the 12,000+ eateries who use Delivery.com and the 6,000+ local pizzerias who use Slice. If the restaurants you frequent don't use either of those sites to help you place an order (instead using a site like Seamless), you probably won't be able to order from them through Facebook anytime soon. Bottom line: Ordering food delivery through Facebook is a real thing, and it's happening right now. What're you still doing reading this? Go order dinner! Lee Breslouer is a senior writer for Thrillist, and is looking forward to using this feature. Follow him to easy delivery @LeeBreslouer.